UPDATED: Tue., Dec. 4, 2018, 11:10 a.m. The Washington State University chapter of the College Republicans wants to build another mockup of a border wall on the Pullman campus to “own the libs mercilessly” and show support for President Donald Trump’s hardline immigration proposal. The stunt would be a sequel to a demonstration the club held in October 2016, shortly before Trump was elected. 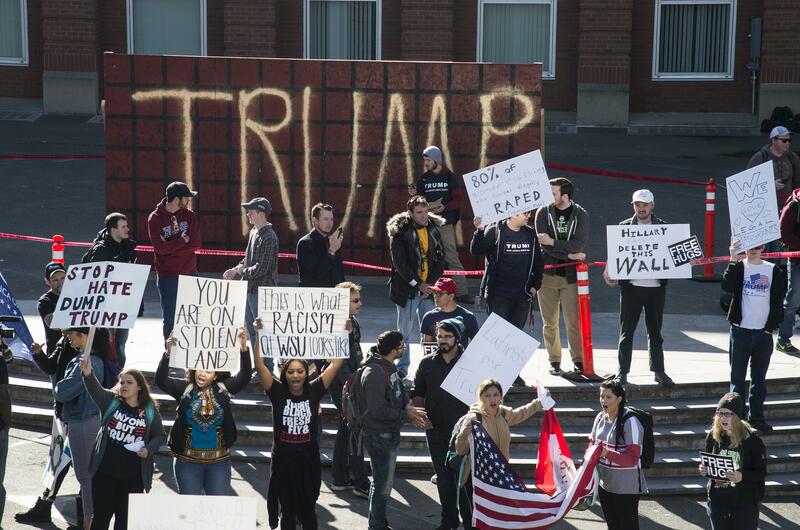 Conservative student activists erected an 8-foot plywood wall, featuring the word “TRUMP” in gold spray paint, prompting a large counterprotest on WSU’s Glenn Terrell Mall. The club at the time was led by James Allsup, who later resigned amid scrutiny for participating in the openly racist “Unite the Right” rally in Charlottesville, Virginia. WSU spokesman Phil Weiler said the College Republicans initially planned to stage the demonstration on Nov. 27 but postponed it because they hadn’t raised enough money. As of Monday the online fundraiser had brought in $415. It wasn’t immediately clear if a new date for the event had been scheduled. Though Rezamand wrote that some of the donated money would be used to pay for permits and security, Weiler said he was unsure whether the university planned to charge the club for such expenses. He said WSU welcomes the open exchange of ideas on campus. WSU and other public schools have previously attracted scrutiny for imposing such charges for events that could lead to violent protests. In 1992, in a case brought by a racist group in Georgia called the Nationalist Movement, the U.S. Supreme Court ruled public entities can’t adjust permit fees based on the perceived likelihood that an event would result in violence, because doing so could infringe on First Amendment free speech rights. That has left some public schools picking up the tab for extra security when hosting appearances by controversial figures. In October 2017, for example, the University of Florida was forced to shell out $500,000 to accommodate an appearance by white supremacist Richard Spencer. In January 2017, the WSU College Republicans complained when the school required them to pay for security at a planned appearance by far-right provocateur Milo Yiannopoulos. The speech later was canceled due to weather, but the club, along with Breitbart News, claimed the school had selectively imposed the security fee to discriminate against their views. Similarly, the College Republicans chapter at the University of Washington claimed UW attempted to stifle the club’s views by demanding $17,000 in security fees for a February rally featuring the far-right group Patriot Prayer. The club sued, claiming the fees were unconstitutional, and in June the school agreed to settle the case for $122,500. During the rally, both Patriot Prayer supporters and counterprotesters clashed repeatedly, and several people were arrested, the Seattle Times reported. Meanwhile, plans for a wall along the U.S.-Mexico border cleared another legal hurdle Monday when the Supreme Court rejected an appeal by the Animal Legal Defense Fund and other groups that said the Trump administration is sidestepping laws designed to protect wildlife and the environment, the Associated Press reported. The groups had challenged a 1996 law that allows the Department of Homeland Security to waive dozens of federal laws to speed up work at the border, saying such authority violates the constitutional separation of powers. By rejecting the appeal, justices left intact a ruling by a federal judge in San Diego that cleared the administration to build several border-wall prototypes and two segments of replacement fence, the AP said. The judge in the San Diego case was Gonzalo Curiel. Trump criticized Curiel during the presidential campaign for his handling of fraud allegations against now-defunct Trump University. Trump, who had already proposed a border wall, suggested the Indiana-born judge’s Mexican heritage meant he wouldn’t be fair to Trump in the fraud lawsuit. Published: Dec. 3, 2018, 8:53 p.m. Updated: Dec. 4, 2018, 11:10 a.m.